THOUGHTSKOTO Thoughtskoto : WATCH: DO YOU BELIEVE DUTERTE ORDERED KILLING MUSLIMS AND BOMBING A MOSQUE? WATCH: DO YOU BELIEVE DUTERTE ORDERED KILLING MUSLIMS AND BOMBING A MOSQUE? - PAOCTF was abolished in 2001 and not in 2002 thus there was no such meeting. - Initially said he was a ghost employee by Davao City Hall and receives 3K per month but later changed it to 5K? - Initial questioning he revealed he killed 50 persons but later on he said it could be 1,000 or more. - Mr Matobato said on 2003 then CHR Delima had a police operation to dig alleged graves and was planned to be ambushed (killed) but the now Senator Delima immediately corrected that it was 2009. - He alleged that he was a ghost employee in Davao City Hall but at the same time works at the police arm office of the City Mayor and receives monthly wage but COA and City Hall officials has already said there is no such ghost employee practices in the city. 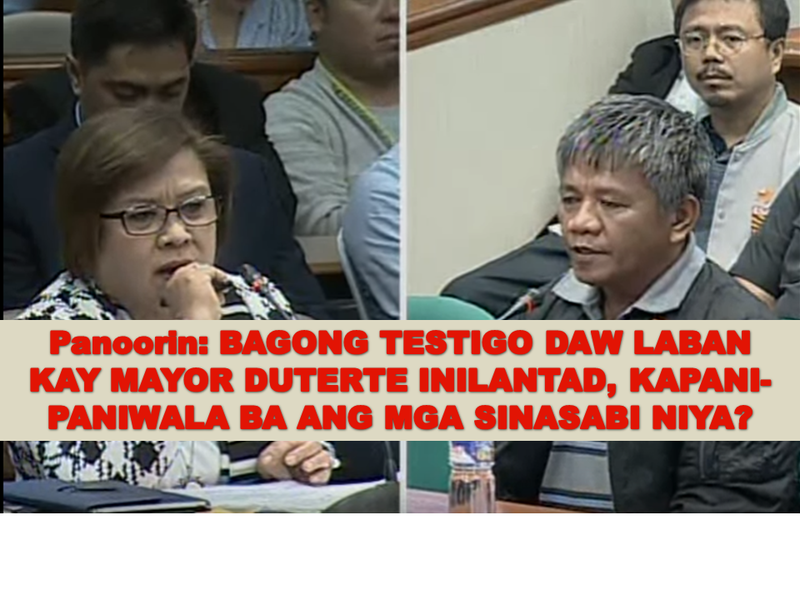 - His confusing statement on who brought him to the Senate to become witness, kaibigan daw nya pero di nya kilala, kilala daw nya matagal na pero bago lang, si father daw sa simbahan ang hiningan nya ng tulong. - He said he does not have any cellphones, access to tv, newspapers, or radio; but... the wife of Richard King called him, but... when he was hiding in Pangasinan his unknown "friend" went to him to get him as witness. - He said he killed a certain terrorist with a name, Sali Makdum. But such name cant even be googled. "Presidential Communications Secretary Martin Andanar on Thursday said President Rodrigo Duterte is not capable of the accusations against him by a Senate witness on alleged extrajudicial killings. "I don't think he is capable of giving those orders," Andanar said at a briefing in Malacañang. Andanar was referring to witness Edgar Motabato's statement that Duterte ordered killing Muslims and bombing of a mosque sometime in 1993. Motabato said these orders were made to retaliate the bombing of Davao Cathedral in 1993. He also claimed that he was part of the seven-member Lambada group formed in 1988. The group was later known as the Davao Death Squad, he said. But Andanar pointed out that even the Commission on Human Rights (CHR) already failed to prove the existence of the said death squad."